Our vice president of technology email list is one of the best databases available to those targeting the technical management leaders. With the aggregated contact information of VPs of technical departments available in one place, this leads list is ideal for your marketing campaign! A VP of technical services often coordinates software and IT solutions; sometimes even working in a laboratory setting. These senior executives and c-level professionals leverage a variety of technologies when solving business problems, providing their services to either the company itself or the greater community. Get in touch with these management executives to make sure your related product or service shows up on their radars! Download a VP of technology email database to access all of the information you need to start marketing to this powerful group of professionals: technical services vice presidents' email addresses, phone numbers, postal addresses, fax numbers, real names, and more. This VP of technical operations mailing list features the contact data of senior technicians and management personnel at numerous companies and institutions into one organized Technical executives email database. Because this industry-specific business database includes everything you'd need to connect, you'll be able to start mailing, email leads, or calling VPs of technology minutes after purchasing and downloading it. 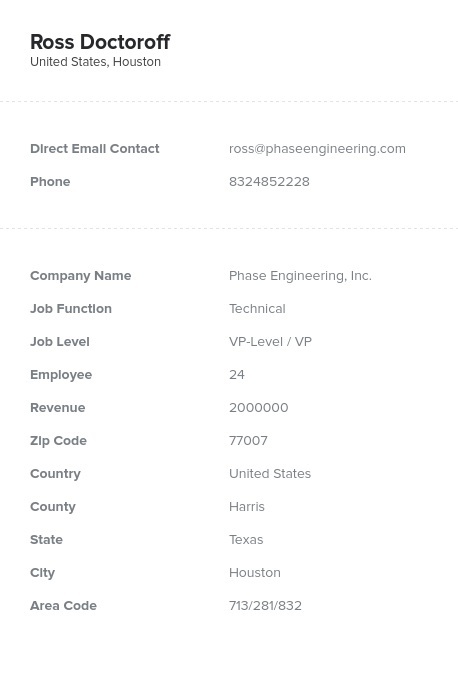 Since it's a downloadable .CSV file that can be integrated right into your CRM, you can apply it to your technical email marketing campaign easily. Buy and download our ready-made email list of VPs of technology or create your own custom list with our list-builder tool!